Well, if you’re reading this, let’s assume you do. So here’s an offer that is hard to refuse. Discounted tickets for The Wine Gang’s Christmas Fair. The Wine Gang are a group of five wine experts who write for the likes of The Observer, The Independent, Stylist Magazine and House & Garden. They also have their own site where they review 200 wines each month in an unstuffy way. 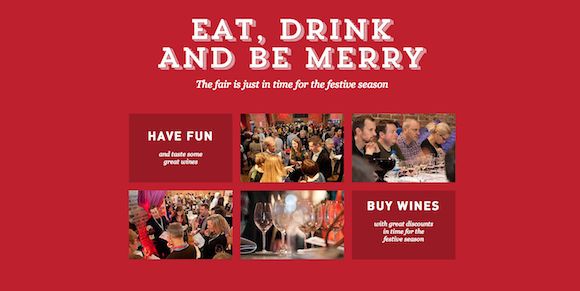 At each fair in November – Bath (2nd), London (9th) and Edinburgh (30th) – there’ll be hundreds of wine to try (or at least choose from to try), masterclasses, and a pop-up shop to buy the wines you like at a discount. An entry ticket for each event costs £20, but if you use the code BLOG40 tickets are just £12 AND you will receive 10% off any masterclass tickets. More details are here http://www.wineganglive.com.